Mohammed Chaudry (45) of St Paul’s Road, Halifax, disqualified from driving for six months, given six points on his licence, £660 fine £66 victim surcharge, £85 costs for speeding. Mark Anthony Fieldhouse (53) of Blackwood Grove, Halifax, given eight points on his licence, £375 fine, £37 victim surcharge, £85 costs for driving without insurance and driving without a test certificate. Jack Kenton (19) of Long Love Lane, Halifax, disqualified from driving for 28 days, £200 fine, £30 victim surcharge, £85 costs for driving without insurance. Reece Grundy (21) of Common Lane, Southowram, given eight points on his licence, £156 fine, £30 victim surcharge, £85 costs for driving without insurance and driving without a test certificate. Sioban Dawn Heigold (39) of Masonic Street, Halifax, given eight points on her licence, £770 fine, £77 victim surcharge, £85 costs for driving without insurance, driving otherwise than in accordance with a licence authorising her to drive a motor vehicle of that class and driving without a test certificate. 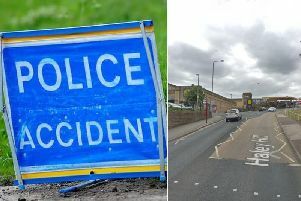 Jordan Macrae (19) of Forest Crescent, Halifax, given six points on his licence, £660 fine, £66 victim surcharge, £85 costs for failing to give information relating to the identification of a driver. Sean Wood (43) of Withins Hill Croft, Illingworth, given three points on his licence, £220 fine, £30 victim surcharge, £85 costs for failing to comply with a traffic sign. Adam Tabaczek (45) of Surrey Street, Halifax, disqualified from driving for six months, given six points on his licence, £660 fine, £66 victim surcharge, £85 costs for failing to give information relating to the identification of a driver and speeding. Sean Richard Mace (33) of Charles Street, Elland, given a community order, £200 compensation for criminal damage of garden furniture, a door and window of an unknown value and given a community order for using violence to secure entry into a premises. Ryan Anthony Croad (36) of Wheatley Road, Halifax, £200 fine, £30 victim surcharge, £85 costs for assault. Ross Maclaughlan (38) of Range Lane, Halifax, £80 fine, £30 victim surcharge, £85 costs for assault. Robert David Taylor (55) of Elphaborough Close, Hebden Bridge, given a restraining order, £80 fine, £30 victim surcharge, £85 costs for persistently making use of a public electronic communications network for the purpose of causing annoyance, inconvenience or needless anxiety. Wasim Akhtar (23) of Wallace Street, Halifax, disqualified from driving for six months, given 10 points on his licence, £150 fine, £30 victim surcharge, £85 costs for drug driving. Arther Nedza (39) of Hanson Lane, Halifax, given six points on his licence, £660 fine, £66 victim surcharge, £85 costs for failing to give information relating to the identification of a driver.